Disc 1 - Come all you Men and Maidens: Everybody's Favorite; Ain't it a Shame to Work on a Sunday? ; I Come from West Virginia; Hook and Line; Groundhog; The Devil and the Farmer; Granny Went to Meeting with her Old Shoes On; Susan's Gone; Natural Bridge Song; The Little Mohee; Wildwood Flower; Old Virginia Gals; Come all you Young Men and Maidens; The New River Train; Cambric Shirt; Pretty Fair Miss all in the Garden; Schottische; Farewell Sweet Jane; The Preacher and his Specs; The Preacher and the Fiddle; Something Sweet to Tell; Crawling and Creeping; Come all You Reckless, Rambling Boys; Free a Little Bird; I Won't Marry at All; Kate's Horn; One Morning in May; The Nightingale; I Never Will Marry; The Lover's Return; Little Sweetheart, We've Done Parted; Last May Morn; Nobody's Business but my Own; Fine Sally from London; Deep Blue Sea; Fair and Tender Maidens; Inconstant Lover; Little Birdie; Woe Unto You, the Time has Come; Come All You Young and Tender Little Girls; Adieu, False Heart. Disc 2 - Cruel Willie: My Little White Hat; The Rowan County Troubles; The Rowan County Crew; Darling Cory; The Roving Moonshiner; Captain Devin; I was Born and Raised in Covington; The Highwayman; Hangman; Callahan; Harlan County Tragedy; Hick Carmichael; Dixon said to Johnson; The Death of Harry Sims; Old Banjo Tune; Jealous Lover; Poor Ellen Smith; In London City; Little Mattie Grove; Pretty Polly; Cruel Willie; Charlotte of Edinborough Town; Katy Dear; The Gay Spanish Maid; The Silver Dagger; Jim Luther; Death of Edward Hawkins; The House Carpenter. Disc 3 - I'll Have a New Life: Farther Along; Little Bessie; Wandering Boy; The East Bound Train; I Know Somebody's Going to Miss Me when I'm Gone; Mother's Grave; Darling Little Joe; The Evening Train; The Day is Past and Gone; Motherless Children; In a Foreign Heathen Country; Robinson Crusoe; The Unclouded Day; Keys to the Kingdom; Little David, Play on your Harp; I'll Have a New Life; While Passing a Garden; In my Father's House; I'm Drinking from the Fountain; I Feel Like Traveling On; Walk around my Bedside, Lord; There was a Man in Ancient Times; The Old Churchyard; We'll Understand it Bye and Bye; Day is Breaking in my Soul. Disc 4 - All I've Got is Done Gone: The Yellow Rose of Texas; Davy Crockett; The Jam on Gerry's Rocks; My Home in the West; Cumberland Gap; Lorena; This Little Light of Mine; Blackberry Blossom; Marching Through Georgia; Brother Green; Morgan on the Railroad; The Dying Cowboy; Garfield March; I Believe I'll Sell this Farm, Jane Ann; Hard Times; There's a Hard Time Coming; "One More Trip" said the Sleepy Headed Driver; The Hard Working Miner; Chinese Chimes; Dusty Skies; The Carter County Tragedy; F D R Reelection Song; Old Age Pension Check; All I've Got is Done Gone; Graveyard Blues; Coal Creek; Notes (Slow Blues); Chittling Cooking Time in Cheatem County; Got Up this Morning; Black Dress Blues; All Night Long; Boat Up the Water; St Louis Blues; Old Hannah; The Coburn Fork of Big Creek; My Peach Trees are all in Bloom; Turkey in the Straw. There's things to reflect on, even before you open the boxes. 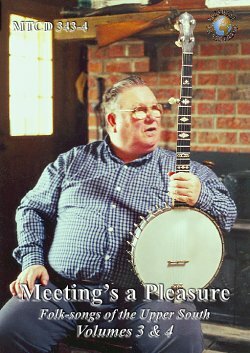 To begin with, the series title, Meeting's a Pleasure, is an initial indication of a particular sensibility on the part of the compiler, Mark Wilson, evidently informed by a strong sense of the social interaction involved in collecting music and songs, that this is less a folklorist treating his informants as historical specimens, than somebody for whom the satisfaction lies almost as much in meeting and spending time with interesting, talented and hospitable people. Next, there's the photographs on the boxes: in distinct contrast to the moody, monochrome photographs of lean mountain-dwellers in plain working clothes that often characterised earlier collections of recordings from the same part of the world (John Cohen's great albums for Folkways, being the classic examples), on the first box we have a bright colour portrait of a laughing, well-dressed, middle-aged couple; take away the guitar and the fiddle and they'd look much like any couple of their generation in the developed world. Then, the sub-title: Folk-songs of the Upper South could be read as making a more carefully considered and more complex statement about the compiler's view of what lies within, than might superficially appear - one that may even be potentially controversial, given the tenor of some of the debate in the pages of this magazine a few years ago about the use of the term 'folk-song'. Some of the definitions that were being suggested in that discussion would surely disqualify a good proportion of what is included here (songs with known - even living - composers, songs learned from records etc). So, even before we've heard a note of music, the stage is set for some fascinating reflections on change and development in the tradition, on the shifting role of the folklorist and on the presentation of traditional musics. (approach) the original artists as if they represent specimens of American gothic; I was lucky to have met a fair number of them and they were, without exception, perfectly sensible and kindly people". In other words, Wilson seems much more interested in these singers and musicians as human beings than - as some seem determined to typecast them - either noble repositories of ancient wisdom, or denizens of some mythical 'old, weird America', both of which are clearly dehumanising tendencies. Can you tell from listening to recordings whether people are sensible and kindly? Of course not, but it's interesting how the humanity of these musicans and singers so frequently comes across from the original tapes - whether in their comments on their tunes (like George Hawkins on All Night Long and Old Hannah), Hobert Stallard's spontaneous laughter at one of the lines in the middle of his rendition of Little Sweetheart, We've Done Parted, or the odd sound of Manon Campbell's fiddle, on Coal Creek, caused by the clothes peg he clamped to the bridge, apparently so that the sound of the music wouldn't disrupt his granddaughter's birthday party. But, just in case I'm starting to convey an impression that these discs function simply as celebrations as what nice people the singers were, let's be in no doubt that they contain an awful lot of great singing, great playing, great tunes and great songs. You want Child Ballads? Here are full versions - not to mention highly impressive renditions - of The House Carpenter, Little Mattie Groves 1 and Hangman, by Nimrod Workman, Mary Lozier (of whom more later) and Sarah Gunning respectively, not to mention fragments of several others. You want union songs? Jim Garland obliges with a powerful Death of Harry Sims. Traditional fiddling? Each disc is liberally sprinkled with examples, from Alva Greene's Wildwood Flower, accompanied by Francis Gillum (an outstanding singer, as can be heard from a compelling, highly-ornamented Keys To The Kingdom on volume 3) beating straws on the fiddle strings, through J P Fraley's Cruel Willie, another beautiful example of the local tradition of playing song airs as instrumentals, to Ray Hilt's virtuoso Garfield March. 2 Guitar picking? What about Henry Hurley's solo Notes, or his brilliantly intricate accompaniment to In My Father's House, or Roger Cooper's showpiece Chinese Chimes. And there's pretty well any other style of traditional or old-time southern music you might wish for: sacred harmonising (including some very contrasting approaches); banjo picking (a good range of styles represented, but I was particularly taken by Manon Campbell's unusual Old Banjo Tune); New World ballads like The Death Of Ellen Smith and (of course) Pretty Polly. There's names as great as Buell Kazee and Roscoe Holcomb 3, both living up to their considerable reputations, alongside names previously unknown to the wider world, like Emma Pruitt, who offers a fine (and, given the context described in the notes, surprisingly robust) In London City or Abe Keibler with his own FDR Re-election Song. I could keep on picking out random highlights, but will contain myself, and just mention the fact that I laughed out loud at Sarah Gunning's tale of The Preacher and his Specs, and - for quite different reasons - at Margie and Gene York's rendition of the bizarre Lorena ('while the fox ate on the wild banana'?). Any major revelations? Mary Lozier was a new name to me, but her eight contributions here - a varied selection of unaccompanied songs and ballads - are highly impressive, in a quiet and unspectacular way. Her straightforward delivery, with scarcely a hint of mannerism, conveys both tune and words very effectively, and most of her versions are full and satisfying. 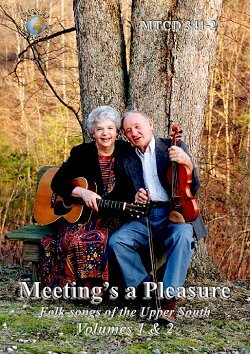 The cover of the second booklet has a charming colour photograph of Mary with her husband John (who plays some mean harmonica on a couple of tracks of his own). I also thoroughly enjoyed the four unaccompanied duets by Nova Baker and Elsie Vanover, two-part harmonies in voices with a most pleasing Virginia edge. But once again, singling out particular contributors seems almost invidious in such a consistently excellent collection. Stretching back almost a century, this region (mostly Kentucky and West Virginia), has produced some of the very richest resources of traditional music and song on record of anywhere in the English-speaking world, and these releases represent a prodigious and immensely valuable contribution to that continuing legacy. There's 131 tracks in these four discs, and an individual analysis of each of them would not only be impractical, but unnecessary, not least as Mark Wilson's very substantial (and as already observed, highly rewarding, in more ways than one) notes can be read in full elsewhere on this site. He has arranged the tracks in broad, though scarcely strict, themes across the discs - volume one is a mixture of lighter-hearted material and love songs; volume two is more serious stuff, ballads and other story songs; volume three has spiritual songs, in a broad sense, from familiar oldtime hymns like Farther Along to more unusual inspirational items like Robinson Crusoe; volume four covers historical and topical songs, plus songs influenced by African American traditions. Each disc, especially the last, is complemented by a good selection of instrumental tunes. The recordings were made in two periods, in the early 1970s and then in the late 1990s, early 2000s. Between the two periods, there are tangible changes apparent - not surprisingly, it seems that there are fewer of the old, individual stylists still around in the later period (as Wilson observes, with feeling, in the notes, the other side of 'Meeting's a pleasure' is 'Parting is grief'), but it seems that there might also have been some development of new approaches in the tradition. The best example of the latter is probably the Dixon Sisters, a group of five unaccompanied harmony-singing sisters recorded as late as 2002. We don't know whether they were singing in this highly-arranged way 30 years ago 6, although I suspect not, but the fact that their repertoire includes good, thoroughly traditional material learnt from their father leaves me in no doubt of their authentic credentials. Although they have arranged their songs with carefully worked-out harmonies and practised timing, the effect - to my ears, at least - seems quite different from what we might be used to from harmony groups in the folk revival. It's always the song at the centre of the performance, rather than the arrangement. Their Little White Hat, with its echoes of the old English Gaol Song, is a particular treat. The last three tracks feature two of the youngest musicians included, fiddle players Roger Cooper and Michael Garvin, recorded in 2005. 7 Both learned their music from impeccable traditional sources in Kentucky (Garvin's grandfather Bert, whose photograph is on the second box, contributes a husky Darling Corey, with a lovely banjo accompaniment, on volume two) and each shows good evidence of it on Coburn Fork (Garvin) and My Peach Trees (Cooper). The whole set concludes with their duet on Turkey In The Straw, with compiler Mark Wilson himself on guitar - the fiddle playing chock full of character, not to mention crisp rhythms, beautifully tight playing and rich harmonies (and the guitar accompaniment is just right). On this evidence, the instrumental tradition is in good hands. The future of an authentic singing tradition in these parts - as in most parts - may be rather more perilous, but that's unlikely to come as much of a surprise to MT readers. Either way, we can be grateful that on releases like this one we have plenty of good and well-documented examples of what it once was like, and the opportunity to spend at least a little time enjoying the company of some of these remarkable people. 1. Mark Wilson writes in the notes that many singers (he cites Buell Kazee and Almeda Riddle, as examples) refused to sing Mattie Groves, regarding it as a dirty song. I know other collectors have said the same. Given that it must, therefore, have had more limited transmission between singers than others of the old world ballads, it's interesting how it has survived in such long, full versions as this, one of the longest tracks on the present discs, or the ones Mike Yates collected in Appalachia (MTCD321-4), or Dillard Chandler's on Dark Holler (SFW 40159). 2. Mark Wilson's commentary on this track, together with that on J P Fraley's beautiful Blackberry Blossom, both of which reference President James Garfield, are excellent examples of the authority and erudition of his notes. 3. One of Kazee's contributions here, Little Bessie, is a song that I have previously associated mainly with Holcomb - and what a contrast. The latter's rendition (on his first Folkways solo album) is more than ten minutes long and one of the most captivating performances I've ever heard; Kazee's, albeit about half that length, is also extraordinary, but in a completely different way. You'd scarcely believe that two men from the same state, singing the same song, picking on stringed instruments (Holcomb on guitar, Kazee on banjo) could come across so utterly differently. 4. I'm referring to those by Annadeene Fraley, to whom Mark Wilson has dedicated this release, and whose photograph, alongside her husband J P, is the one I described at the start of this review. In some respects, these tracks are out of character within the context of the others on these discs, although I understand why they are included, and feel without reservation that they belong here, not least as I enjoyed listening to them. 5. On the contrary, I've always taken some small pleasure in this kind of thing, provided it's unobtrusive, and a propos of previous comments, it can offer a further reflection of the real and human context of the singers' lives. 6. There's a cheery photograph of the sisters on the cover of the first booklet, and my ungallant guess would be that they belong to a generation born between the Depression and the end of the Second World War.